The 2005 Washington Redskins season was the franchise's 73rd season in the National Football League. This season began with the team trying to improve on their 6–10 record from 2004. The Redskins placed 2nd in the NFC East. Washington earned their first playoff berth since 1999. The Redskins restructured the contract of Pro Bowl left tackle Chris Samuels, with the "seven-year deal is worth roughly $47 million and includes the richest signing bonus in franchise history." 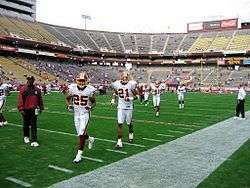 The Redskins finished the 2005 preseason with a record of 1–3, losing to the Carolina Panthers 28–10, losing to the Cincinnati Bengals 24–17, defeating the Pittsburgh Steelers 17–10, and losing to the Baltimore Ravens 26–20. The game was close at the half with the Redskins leading 7–6. That would soon disappear as the Chiefs took a 14–7 lead on a 6-yard touchdown run by Priest Holmes. After Mark Brunell was sacked for a 9-yard loss, Santana Moss tied the game on a quick pass to the left flat as he ran 78-yards for a touchdown. The Chiefs would retake a 21–14 lead on a Sammy Knight fumble recovery for an 80-yard touchdown along with a successful two-point conversion. In the final seconds of the third quarter, Brunell hit Chris Cooley with an 11-yard touchdown catch to tie the game once again at 21–21. Trent Green hit Holmes on a 60-yard touchdown catch to seal the deal for the Chiefs as Brunell and the Redskins would fail in a comeback in the final seconds of the fourth quarter. With the loss, the Redskins dropped to 3–2. After two close, consecutive, and heartbreaking AFC losses in the last two weeks, the Redskins returned home to welcome the lowly 49ers to town and unleashed a scoring barrage, winning 52–17. 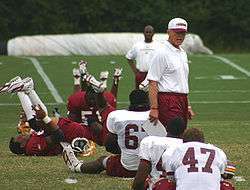 After failing to score on their opening drive in each of their first five games, Washington scored first on a 6-play, 61-yard drive that ended with a 2-yard touchdown pass from Mark Brunell to Mike Sellers. After forcing another San Francisco punt, the Redskins drove another 60 yards for another score, this time a 5-yard run from Clinton Portis. After two more touchdown passes by Brunell, one each to Sellers and Santana Moss, combined with two more 1-yard touchdown runs by Portis and a Nick Novak field goal, the Redskins led 45–7 after three quarters. Washington finished their blowout with a 4-yard touchdown run by Rock Cartwright to make it 52–7. San Francisco did score twice on a 72-yard run by Frank Gore and a 47-yard field goal by Joe Nedney. With the win, Washington improved to 4–2. Following their lopsided blowout win over the 49ers, the Redskins headed to the Meadowlands for an NFC East duel with the New York Giants. Looking to follow up with another impressive win, the afternoon turned out to be a miserable one for the Redskins, getting shut out 36–0. The Giants, playing with heavy hearts after the death of owner Wellington Mara, got off to a fast start with a 57-yard run on the game's first play, leading to a Jay Feely field goal. Barber finished with 206 rushing yards on 24 carries. The 36–0 shutout dropped the Redskins to 4–3. Looking to rebound from a 36–0 shutout against the Giants, Washington returned home for a second consecutive NFC East matchup, this time against the Philadelphia Eagles. Earlier in the week, Eagles WR Terrell Owens was suspended for conduct detrimental to the team. During the game, Philadelphia drew first blood with a 56-yard touchdown pass from Donovan McNabb to Reggie Brown that put Philadelphia up 7–0 after the first quarter. Washington responded with a John Hall field goal and a Mike Sellers touchdown run to lead 10–7 at the half. In the third, the Eagles added a David Akers field goal, and the Redskins responded with a Clinton Portis touchdown run to make the score 17–10. In the fourth quarter, with time winding down, the Eagles driving, safety Ryan Clark intercepted a McNabb pass with 1:25 remaining, sealing the win and improving the Redskins to 5–3 at the halfway point in the season. At the halfway point of the season, the Redskins' record stood at 5–3, tied for second in the NFC East with Dallas. On Week 10, the Redskins marched to Tampa Bay for a matchup against the Buccaneers. Tampa Bay struck first with two touchdown runs by Mike Alstott. This made the score 14–3, with the only Washington points coming on a John Hall field goal. After Alstott's second touchdown, Ladell Betts returned the ensuing kickoff 94 yards to bring the score to 14–10. Tampa Bay would respond with a 24-yard touchdown pass from Chris Simms to Joey Galloway, making the score 21–10. Washington would get another John Hall field goal to make the score 21–13 at halftime. 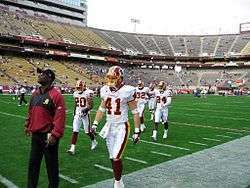 After halftime, Washington took their first drive of the second half into the endzone on a 7-yard pass from Mark Brunell to Mike Sellers, followed by a converted 2-point conversion on a pass to Clinton Portis, tying the game. Washington also scored on a 17-yard touchdown pass to Ladell Betts, giving the Redskins a 28–21 lead. As the third quarter winded down, Simms completed a 4-yard pass to Ike Hilliard to tie the game at 28–28 entering the fourth quarter. Portis added a 5-yard touchdown run to give the Redskins a 35–28 lead. With the game on the line, Simms led Tampa Bay to a game-winning touchdown drive with a 30-yard pass to Edell Shepherd. The Redskins appeared to have blocked the extra point attempt, but were ruled offsides. As a result, Tampa Bay elected to go for two, and successfully converted on a controversial run by Alstott, handing the Redskins a 36–35 loss and dropping them to 5–4 on the season. The Redskins earned a playoff berth on the back of a 5-game winning streak to end the season. They beat the Tampa Bay Buccaneers in the Wild Card round before losing to the Seattle Seahawks in the Divisional round. It was the Redskins' first trip to the playoffs and first playoff win since the 1999–2000 NFL playoffs.